(Nov 2) Mystery poster. 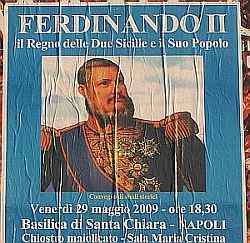 It is not uncommon to find posters on billboards for events or discussions about the history of the kingdom of Naples (i.e. southern Italy before the unification of the nation in 1861). This year has marked the 150th anniversary of united Italy; thus, there have been a few events about the last days of the Bourbons. The next-to-last monarch was Ferdinand II and it is natural that there might be a few things about him. The other morning I noticed a fresh poster displayed at various points along the length of my street. It was an ad for a full day of lectures and discussion about Ferdie the Deuce. Fine. Then I saw the date—May 2009! I have no explanation for this; the posters have just gone up and are in very fine condition. I welcome theories. Honest mistake? Why waste a good picture of the king? Skulduggery by opponents? (Nov 2) I emphasize, underscore, and really jump up and down on my objection to getting "trick-or-treated" by Neapolitan children the other night — late afternoon, really. (5.30 PM?!) Somehow they got by the dogs and sentries. This is another example of globalization gone nuts. See this entry on Halloween. There is a small variation, however; this year they expect coins and are very disappointed if you drop candy in their bags. They catch on fast. 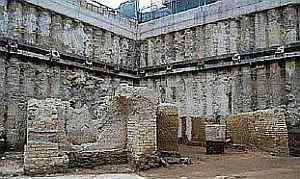 (Nov 11) When the large underground Metro station at Piazza Municipio is finished, it will be a museum of sorts, incorporating parts of the Spanish walls that protected the adjacent Angevin Fortress and even display the three Roman boats excavated and restored a few years ago. We can now add the newly discovered ruins of a Roman thermal bath complex. I imagine they will leave the ruins in place and work around them. It was a significant structure, found at about 15 meters below the current street level, meant to accommodate patrons who had just disembarked and needed to freshen up a bit. The baths were at the beginning of the road named Per Cryptam—that is, the road that led to the "Neapolitan Crypt" (tunnel) about a mile away to the west, the tunnel that then passed beneath the Posillipo hill on the way to Pozzuoli. (Nov 16) Napoli Underground (NUG) has developed a new application for the iPhone and iPad called iTour Na. The app provides tourists in Naples with descriptions, photos, videos, maps, etc. (back-rubs?) of what there is to see and do in Naples. In other words, it's an electronic guide-book complete with GPS mapping that pin-points the user’s geographic location and provides directions to reach a specific site. Also, iTour Na lets you type in travel notes about the places you visit and then share your impressions via email. The app is complete in the Italian-language version and almost complete in the English version. A thorough description in English of the application, updates on English-language availability and a link to downloading are available on the NUG website here. Oh, it's free, but I was kidding about the back-rubs. On the other hand, the developer, Sirio Salvi, the developer, is an ingenious young man; he was responsible for the iSanGennaro not too long ago, so one never knows! (Nov 29) Readers may know about Giuseppe Sanmartino's The Veiled Christ, probably the most famous sculpture in Naples. In 2008, Felice Tagliaferri, 41, from Bologna asked permission to touch it lightly since he was blind. He is also a professional sculptor and even runs an institution in his home town to teach "tactile art" to others who cannot see. Museum guards at the display in Naples refused his request. 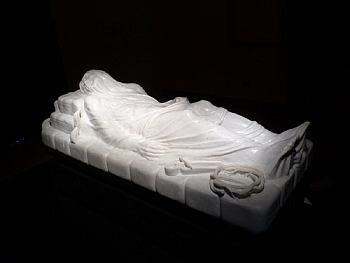 This irritated the artist such that he raised 16,000 euros, bought a 4,000-kg block of Carrara marble and, working from descriptions by sighted friends, made his own life-sized copy (photo, right) entitled Cristo ri-Velato (both "re-veiled" and "revealed" in English.) He has had the satisfaction of displaying the result at the National Museum in Naples earlier this year. It is on permanent display (although it may be included in temporary traveling exhibits) at the remarkable Homer Tactile Museum in Ancona. Tagliaferri smiles and says, "It is forbidden not to touch the exhibit." (Jan 1 ) The new iBrick! One of the most infamous scams in Naples is the sell-and-switch. The mark sees you, the con-man, put the camera he just paid for in the box, is distracted by your accomplice and doesn't see you switch the box for another one; he gets home, opens the box and finds a brick. There is a good and very funny film about this. The trick has now gone high-tech. This has nothing to do with a recent case at a Walmart in Atlanta, Georgia, where a customer tried to return an iPad because he claimed the box contained only the non-functioning window-display model. This story does involve the iPad, yes, but it's 324 times better! The papers are vague on names and how the investigation is going, but a company in Assago (near Milan) ordered 324 iPads "through an intermediary in Campania" (the province of which Naples is the capital). The company paid €148,000. The company received 324 boxes, each one containing a brick. (Jan 18 ) Sneaky installation art? I don't think so, but you never know. I missed the traditional, mammoth bit of New Year's installation art in Pizza Plebiscito this year. I don't mean "missed" in that I regret I wasn't there, but "missed" in the sense that the city didn't pay outrageous sums of money to install anything (see this link for past examples). (They also skipped last year, as well, opting for a smaller installation in Piazza dei Martiri.) 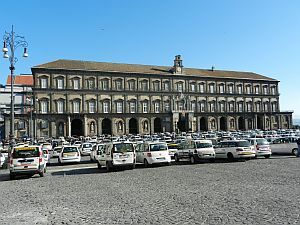 But the current taxi strike has installed hundreds of parked cabs in the square, not as many as there used to be when the square was a squalid parking lot, but, still, it's a start! It reminds me of the "modest proposal" (paragraph 1 in "Driving Miss Godzilla). The cabbies are protesting the "liberalization" of their profession. I'm not sure what that means, other than that it may have something to do with making cab licenses available to anyone who wants one. Scientists in Pozzuoli are dismayed over the lack of funding for their project to explore the energy-producing potential of the bacteria known as thermotoga neapolitana, a thermophile organism that digests organic waste and converts it into hydrogen gas. The head of the project said, "Without funding we can make no progress, and our researchers are just going to go off and work elsewhere. It's a shame." Then the article could have filled in some of the science: Thermophile means heat-loving and describes organisms that thrive at the great temperatures at sea-floor vents and the many thermal vents in Pozzuoli, such as the Solfatara, etc. etc. Then follow with a description of the small research facility in Pozzuoli and the fact that funding was cut off in 2008! The good news is that maybe some European funding is in the works. Certainly, some emphasis should be on the enormous gap between a working table-top proof-of-principle model and a facility that turns garbage into gas on an industrial scale. But, no, the article told us how wondrous this discovery is without mentioning that journal papers on thermotoga neapolitana go back to the early 1990s. Then, it got side-tracked into mentioning that the fumes of Solfatara also function as a natural Viagra. (That's good news for all those bacteria looking for love!) "What a shame" was at the end. That's called "burying the lead." (Feb 10) The Russians are Coming! That was the cry in most newspapers the other day. Of course, the Russians have often been here in one way or the other, and locals like to boast of the visits over the years of Gorky, Lenin, Rudolf Nuryev and many others. But now they're buying property! Not just any property, either. 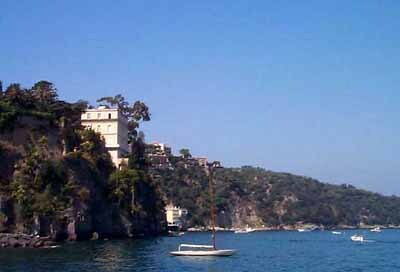 The latest to go—if the deal goes through—is the famous villa Tritone in Sorrento (photo, right). It has just been sold by the Sorrentine ship builder Mariano Pane to a young (22 years old!) Muscovite woman, Kamilla Dzhanashiya, for 35 million euros! (Kamilla has a very profitable paper route in the mornings in Moscow.) The villa is very historic. It is prominently connected with presence of historian/philosopher, Benedetto Croce, who was under arrest here by the Fascist government during WWII and successfully resisted a plot to kidnap him from the villa. The villa is of interest to naturalists because of the extensive gardens and to archaeologists because of the presence of Roman relics. It is, in short, somewhat of a national treasure for a variety of reasons. (Feb 22) At this link, our friends at Napoli Underground have started an on-line gallery of artwork related to the caves and grottoes beneath Naples. From their English-language introduction (by Larry Ray): "The twenty-two illustrations include the first series of this art that has been uncovered in ongoing research. Originals are located not only in collections in Naples but literally around the world in museums and private collections. Each piece lists artist's name, date, type of media, dimensions of original work and its current location."